Lily isn't the biggest bath time fan but of corse, its something that has to be done. She needs to have baths. 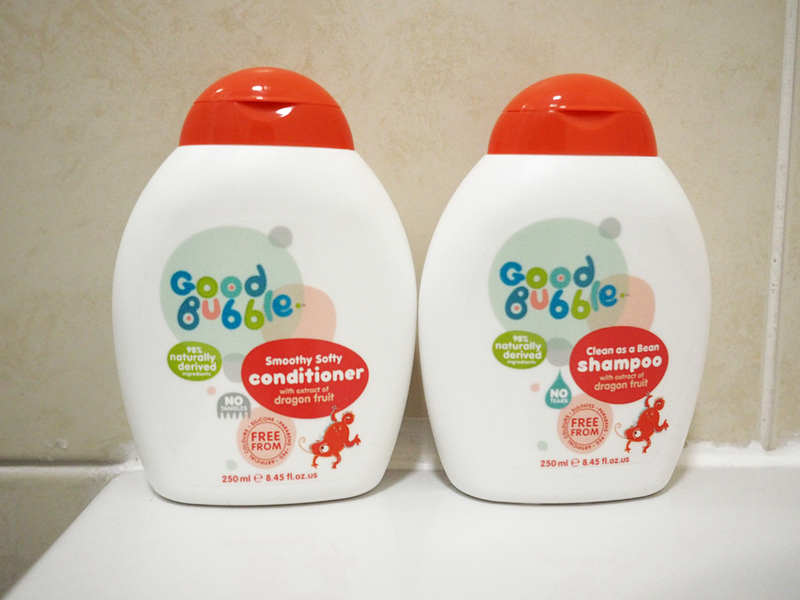 So when Good Bubble offered me some products to review I thought it may be a good opportunity to try then out and see if they help lily enjoy baths more. 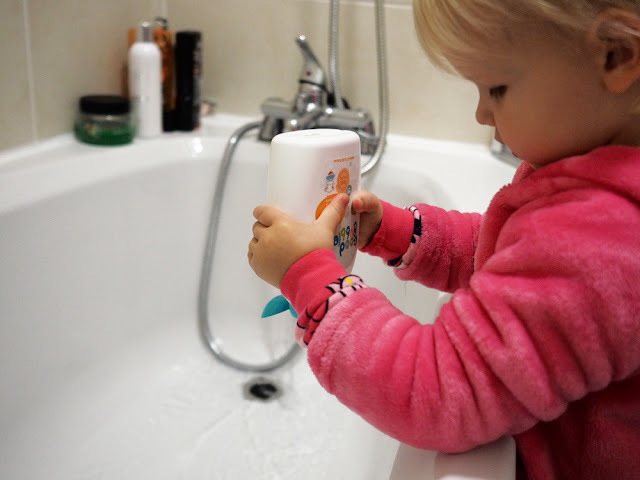 Good Bubble make natural and fun bath stuff to get your children squeeky clean. They do lovely sets with a bubble bath and a character hand mitt inside. The hand mitts are named Clara and Dexter. Dexter is a Dragon and the bubble bath he comes with has real dragon fruit extract inside. Clara's bubble bath comes with real cloudberry extract. Both make lovely gift sets. Good Bubble sent me a set with Clara Cloudberry in it. They also sent me some shampoo and conditioner to try. As soon as I opened up the box with it all in, I could smell it straight away. It smelt amazing. We were sent the dragon fruit shampoo and conditioner and I really did love the smell of it. I couldn't wait to try it with Lily. The Clara bath mitt is so cute. I love her pretty face and the material of the mitt is so soft. It is a nice size too and fits nicely over your hand. I really hoped that clara would be able to invite Lily to come and have a bath. The bubble bath which is natural and made with cloudberry extracts helps nourish young skin. I was really happy to read how natural the bubble bath is as Lily suffers with Eczema and so the bubble bath really does have to be kind to her skin. It also smelt amazing and you could smell it as soon as you lifted the lid. Lily wanted to put her own bubble bath in, which was great as I think it encouraged her to be involved in bath time. She could easily do it herself although I had to stop her from pouring too much in. You really don't need to squeeze hard for it to come out. The bubble bath started making bubbles straight away. My bath is really useless and the power of the water doesn't come out very fast and so hardly ever makes many bubbles but it seemed to do well with this bubble bath. When it came to getting in the bath as usual I had to really convince her to get in. I told her clara wanted her to come in the bath but that didn't work and she refused. But I did as I usually did and got her undressed and just placed her in. She winges for a few moments and then gets used to being in there and starts to play. I introduced Clara to Lily more and made a voice for her. Clara said she was going to wash Lily and so I dived her into the water. But Lily wanted to hold Clara and actually do the washing herself. This is fine with me. It was great to see Lily enjoying washing herself with Clara. Lily then did something I never thought she would. She started to wash her own hair. She lifted Clara and rubbed her head until her hair was nice and wet. Its great that Lily feels so comfortable with this character and that its helping me get Lily all nice and clean. After this, it was time for me to wash Lily's hair with the shampoo and conditioner. I wasn't sure I would manage to do both and at this point wished it was a shampoo and conditioner in one. Lily hates having her hair washed. I put a very small amount of shampoo on my hand, a small amount is all that is needed as Lily doesn't have much hair. I then rubbed it into her hair. Lily didn't complain at this point. The point she usually complains is when i'm getting the shampoo out of her hair. Which has to be done. So I told Lily to hold her head up high, which she did. I then used clara to wash out the shampoo. Instead of pouring water over her head, I just stroked her hair with the wash mitt. I said to Lily that clara is stroking her hair. It worked great and Lily winged a little bit as a small amount of water got in her eyes but not as much as she normally does. The bottle says "No Tears" on it and it really was true. There was no tears! Clara made it 10 times easier to wash Lily's hair!! Thank you Clara!! It also washed out so easily. Some shampoo's just don't seem to wash out at all. 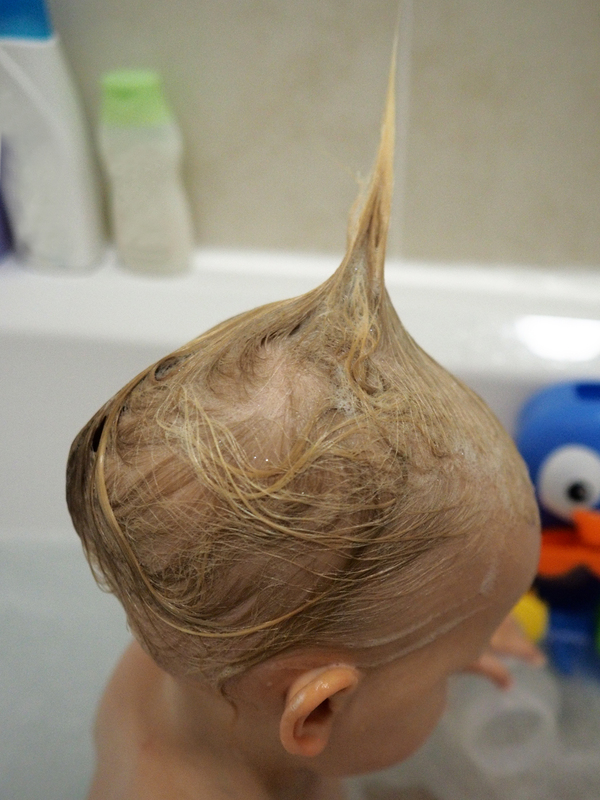 I even managed to condition Lily's hair so that shows how easy it was to wash Lily's hair with the Good Bubble products. So now Lily was all clean and it was time to get out of the bath. Later that night Lily was sat on my knee and her hair smelt amazing. I just couldn't stop sniffing it. (As weird as that sounds) Her hair was also super soft and shiny. Lovely! I really am really happy with these products and can't wait to use them again next bath time. You can head to the Good Bubble Website here to find out more and see some other brilliant products. Good Bubble have kindly let me host a competition for you all to win a Dexter or Clara set of your own. Enter below on the Gleam App for your chance to win. I would love to win the Dexter dragon fruit set. Dexter Dragon Fruit, perfect for the kids!! Please could I have the Dexter Dragon Fruit, thanks. 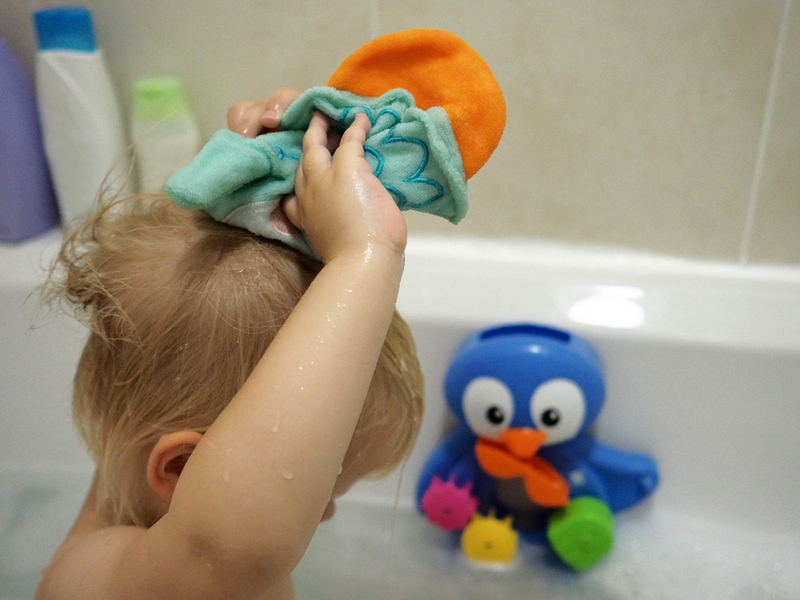 We'd love Dexter Dragon Fruit please - my eldest has Clara Cloudberry already and her bath bubbles were gorgeous - would be great to win Dexter for my youngest so they have a character mitt each and of course the products are lovely to use! clara cloudberry is so cute! Dexter Dragonfruit for my little boy please. Dexter Dragon Fruit for my nephew. I'd like to win Dexter Dragon Fruit. I would love to win Clara Cloudberry for my daughter! Both very cute indeed but Clara for us please. My younge brother would love the Dexter set!